Here’s a little insight into my 20s… I was a vegan. Yep, full-fledged – no leather shoes, no salmon-munching, 100% vegan. I was that way for just over two years and although I felt perfect for 60% of it, after time my health started to deteriorate and I came back to having meat in my diet. But, I still crave veggies A LOT. I put them on my brekkie plate, I munch on them for snacks and dinner is packed with them. 1) Dahl. This is a recipe I wrote for the team at Mumtastic. I adore it because it’s a little sneakier than a standard Dahl and has a bunch of pureed pumpkin in it. It’s the same colour as conventional Dahl and just as good. Want to up the veggie ante even further? Serve it with cauliflower rice and greens. 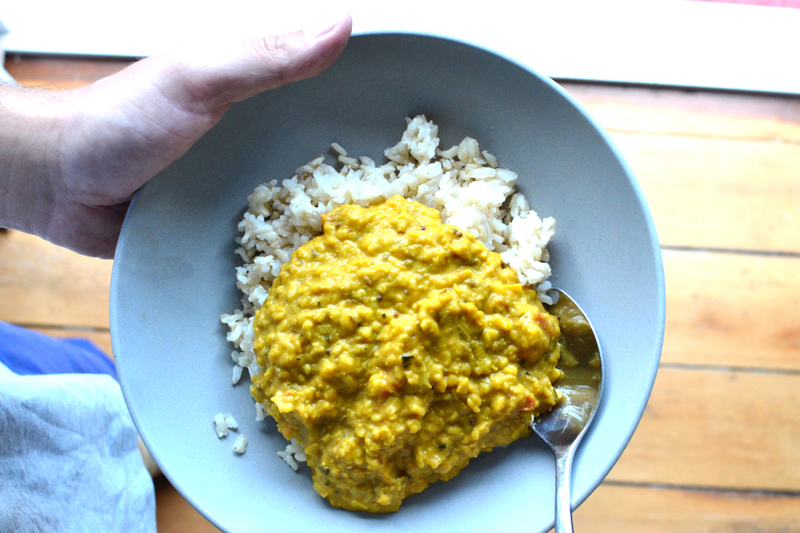 Grab my dahl recipe on Mumtastic here. 2) Veggie nachos. When kids see nacho chips, cheese and guacamole things are bound to end well. I make my version with tinned lentils, tomato passata and a few herbs. Nothing fancy, just a yummy dinner the babes will adore. The recipe for this one you’ll enjoy in week 2 of my family meal-planning course. I’d love for you to join the course here. 3) Veggie fried rice. Lately, I’ve been making fried rice using cauliflower that I blend into rice texture. It’s just like normal rice; only it’s a veggie and a lot quicker to make it than cooking the standard stuff. The full recipe is in my meal planning course that kicks off on Monday, but if you want to whip one up tonight. Shred a bunch of veggies, make the rice and use some fresh ginger and coriander to flavour the rice, with a generous pour of tamari and a touch of sesame oil. 4) Sushi. My time-saving sushi hack is to mash your rice with an avocado, so it comes together – no peeling the rice of the avocado here! In the middle of the sushi, I’ll pop a few bits of roasted veg the kids like and roll it up. Perfect, huh? Oh, and if you want to add a little protein, this one is great with tuna mashed through the rice too. Grab the full recipe for my brown rice sushi here. 5) Hashbrown. I know this one sounds like a brekkie dish, but it’s my go-to dinner when it’s 6 pm and I haven’t thought about dinner. Grated sweet potato and a stack of kale the kids happily eat. Happily! Amazing, I know. Leave the bacon off and make this one. Honestly, it’s a game changer (and will be in the meal plan too). It’sLOVED by all kids. Grab the recipe for my hashbrown here. If you want 2017 to be the year your babes happily eat more veggie meals, then please scoot over and join my meal planning course. For 4 weeks I’ll send you a meal plan, recipes, plus a shopping list. There will be a bunch of veggie meals, a bunch of meat-based ones, and some fish dinners thrown into the mix too.